The Pilliga State Forest in NSW is a vast area of National Park and State Forest located between Narrabri in the north and Coonabarabran in the South. Covering an area of about 3000 square kilometres, Pilliga State Forest is home to a huge variety of native animals and plants. With it’s vivid orange soils, rocky outcrops and scrubby woodlands, it is a truly diverse area. The Pilliga is roughly split in half by the Newell Highway. There is plenty to see and do on either side of the highway. 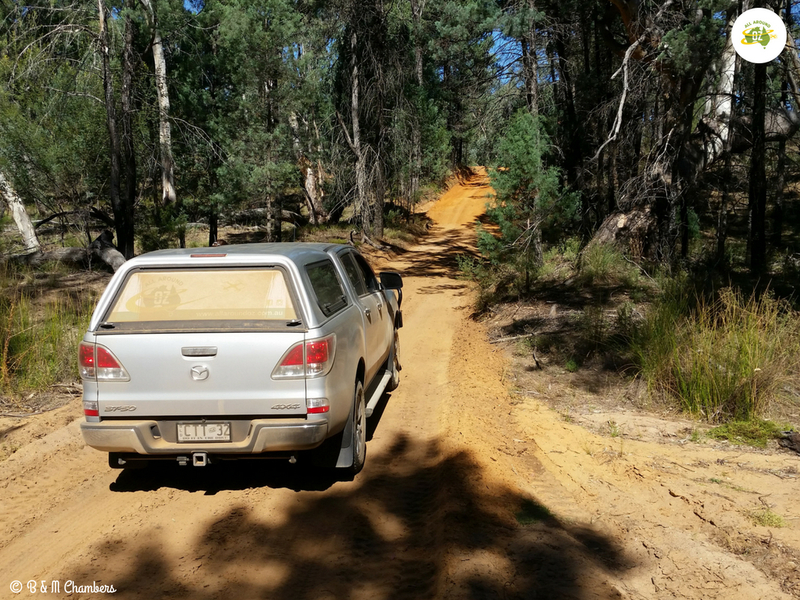 To access most parts of The Pilliga you will have to drive on rough, sandy and corrugated roads. Many of these roads become impassable in wet weather. At all times, use caution when driving in this area. The roads in The Pilliga are rough, corrugated and sandy so care is needed when travelling in the area. One of the easiest spots to access is Pilliga Pottery and Barkala Farmstay as it is just a short drive off the Newell Highway. I fell in love with this little hidden gem, even though we didn’t have the chance to stay there. 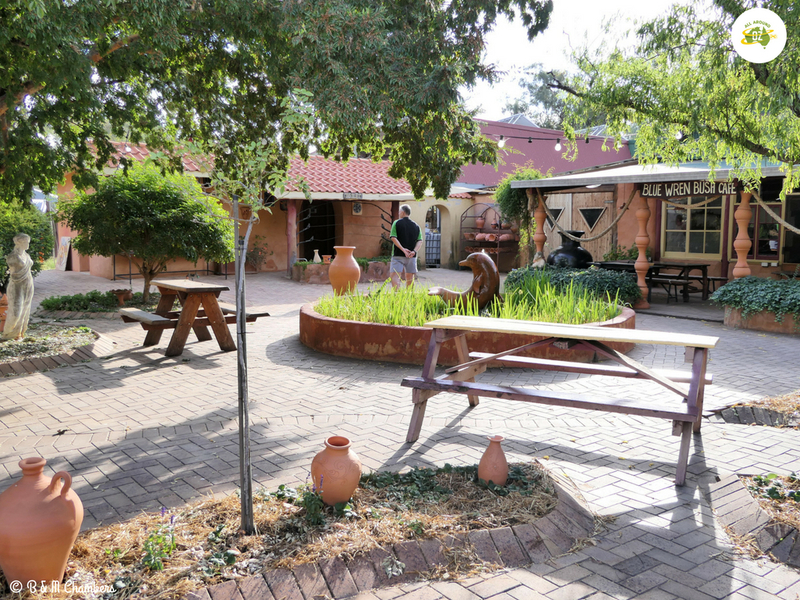 Pilliga Pottery is located at the front of the property and has an almost Mediterranean feel to it, with it’s dolphin fountain, shady trees and terracotta hues. The courtyard at Pilliga Pottery is the perfect spot to relax. This was the perfect spot to enjoy afternoon tea from the Blue Wren Bush Cafe. I had a delicious piece of home made Apple Crumble with fresh cream and a coffee for a mere $12.50. The pottery itself is breath-taking in it’s beauty. Much of it features the tiny blue wrens which can be seen flitting around the farm. The colours are so vivid and the attention to detail is evident in each piece. Be prepared to pay a hefty price though if you want to take a piece home with you. If you want to stay at Barkala there are several accommodation options available. These include lodge accommodation, guest houses and a camp ground. There is also a beautiful swimming pool available for guests to use during the very hot summer months. 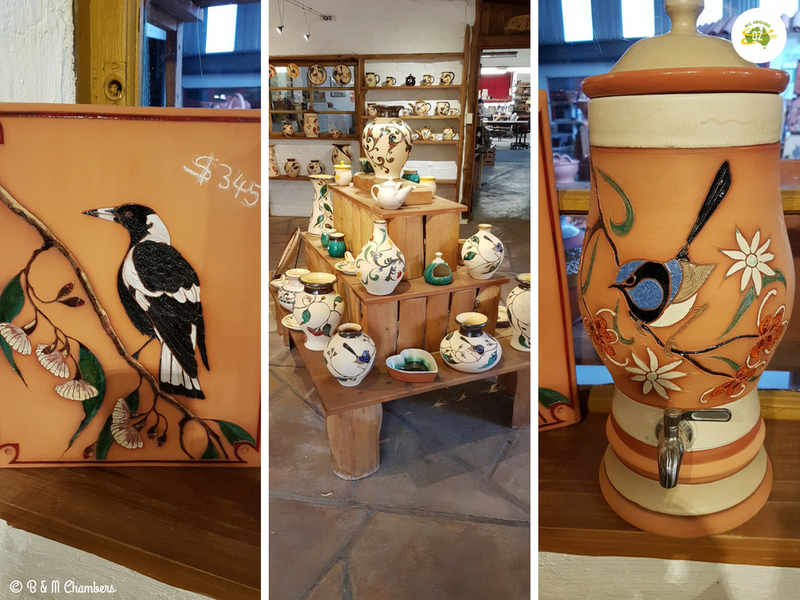 The colours and attention to detail in the pieces produced at Pilliga Pottery are amazing….so are the price tags! 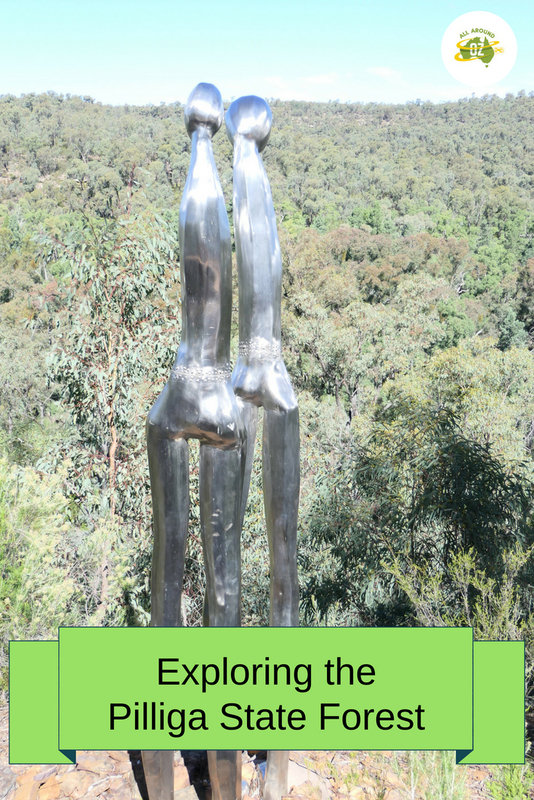 Sculptures in the Scrub is located in the Timmallallie National Park section of the Pilliga, about 40 kilometres east of the tiny town of Baradine. 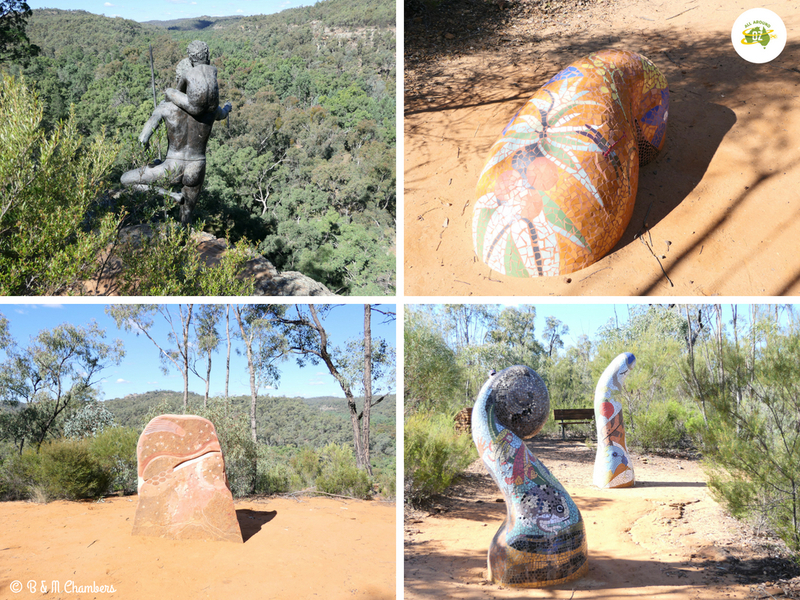 A group of five sculptures scattered along a 1.2 kilometre long walking trail, they should be your number one reason for visiting the Pilliga region. The views are nothing short of spectacular. From the rugged, rocky outcrops of the cliff face high on the other side, to the peaceful serenity of the valley below. You will be awestruck by the beauty of the area. The Sculptures in the Scrub are truly unique. A three kilometre walking track leads from the carpark along the cliff top where the sculptures sit. Then makes it’s way back along the valley below. There are a number of stairs at the beginning of the walk so you will need to be reasonably fit. Allow a good 45 minutes to an hour to complete the walk. Sturdy shoes, sunscreen, a hat and water bottle are recommended. 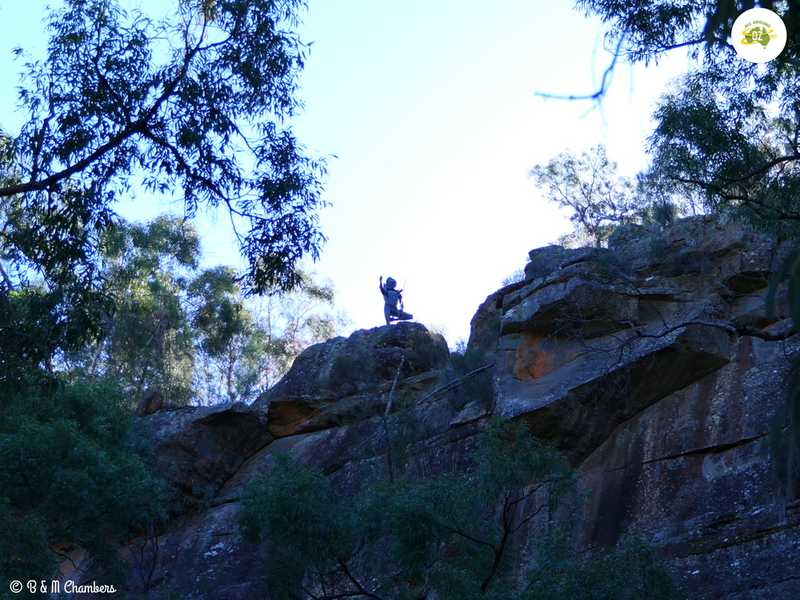 Looking up from the walking track below, it actually looks like a real person standing on the cliff top. Best of all there is a large free camping area here. I would recommend a high-clearance vehicle and van to get into this area as the road is gravel, rough, sandy in places and full of corrugations but so worth it! If you want to learn more about all the Pilliga State Forest has to offer, then a visit to the Pilliga Forest Discovery Centre is a must. Located in Baradine, the very knowledgeable staff will provide you with all the information you need to know before you head out into the Pilliga itself. There is also an interactive display of the flora, fauna and Aboriginal Cultural Heritage of the area. Also in Baradine you will find the lovely Freckles Coffee Spot. Here you can enjoy some morning tea or lunch in Baradine’s former Embassy Theatre. Another option for accommodation can be found at Camp Cypress. Located just on the outskirts of Baradine there are both cabins and camp sites available. 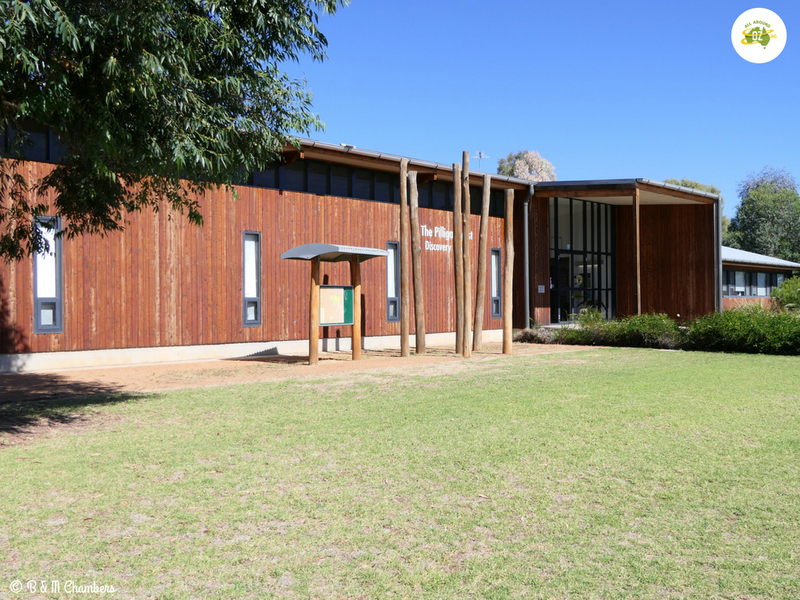 Make sure you visit the Pilliga Discovery Centre before you go exploring the area.